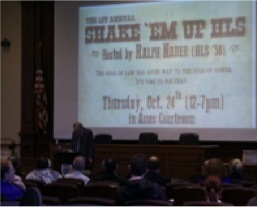 Recently twelve speakers joined Ralph Nader for an unprecedented “Shake ‘Em Up HLS” event in Ames Courtroom. They came from diverse backgrounds, but they were united by their conviction that the American legal system is broken, and by the urgency of speaking to Harvard Law Students to stir them to do something about it. Students and faculty in attendance heard about a wide range of substantive areas of law, and a variety of ways in which legal institutions are broken. The substantive areas included tax law and its purpose (David Johnston), the cannibalization of tort law through mandatory pre-litigation arbitration (Michael Rustad), the inadequacies of America’s pension system (Karen Ferguson), the dramatic shift in the judicial system against plaintiffs and access to the courtroom (Arthur Miller), the importance of whistleblowers (Tom Devine), and the role of science in law and legal education (Sheldon Krimsky). Betsy Cavendish urged students to reject the single-minded focus on litigation as a theory of change and to focus on institutions other than courts. Numerous speakers addressed broken institutions – from a prison system that dehumanizes the masses incarcerated within it (Bruce Western) and a national security apparatus reliant on drones and mass spying (Ramsey Clark and Tom Devine), to a political system undermined by corporate power and money (Jeffrey Clements). The connection between each of these broken institutions and one more institution that could do more to repair them was most explicitly drawn by Bruce Fein, who discussed how Harvard Law School worked with the American people in the aftermath of Watergate, as HLS professors decamped to Washington in parallel with the millions of telegrams the American people sent to complain after Nixon fired special prosecutor Archibald Cox. Fein contrasted this with the muted response to revelations about spying and presidential declarations of power to kill without oversight. After Ralph Nader’s introductory remarks about the importance of justice in a law school curriculum and the horror of law without justice, Edgar Cahn asked about the purpose of Harvard Law School. Given a legal system that perpetuates injustice in so many ways, he urged students to ensure they learnt what they needed to know to begin to repair the legal system. Over the coming weeks, HL Record contributors will be covering many of the issues that were raised in and by Shake ‘Em Up HLS. In the meantime the entire event is available online at www.youtube.com/user/shakeemuphls.